Recently I wrote a contribution (in Dutch) for the Agora Magazine special issue about smart cities. In the essay I suggest three alternative imaginaries for smart and social cities: data city, playful city, and maker city. All of these imaginaries have hackability as a central quality. Here’s the scan of the essay. de Lange, Michiel. 2017. 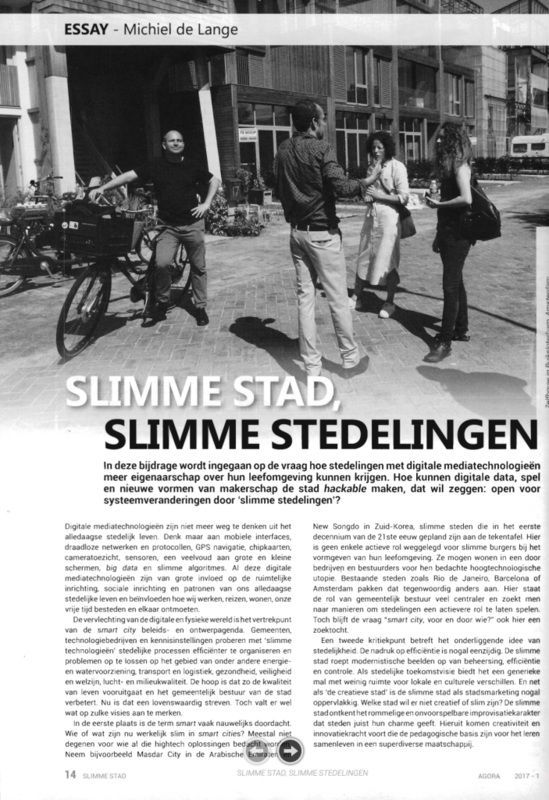 Slimme stad, slimme stedelingen. Agora Magazine voor sociaalruimtelijke vraagstukken, 14-16. Photo credit (cropped in scan): Victor Wollaert.